Allyn Robinson will be celebrating his 42nd Consecutive Year at The New Orleans Jazz & Heritage Festival playing with Luther Kent & Trick Bag on Sunday, April 28, 2019! Jazz Fest organizers recently announced the lineup for the 2019 Festival scheduled for April 25 to May 5, 2019. Luther Kent & Trick Bag will be raising it to the heavens on Sunday April 28, 2019. The show times have not been released so stay tuned as information is updated. Make sure to mark your calendar and come on down for Allyn's 42nd Year at the Jazz Fest! In the meantime, let's get the party started with Ain't Nothing You Can Do (click to watch) from Jazz Fest 2013. Started in 1970, the Jazz & Heritage Festival continues to showcase the most storied names in music history alongside many of Louisiana's equally respected musical artists. A true heritage festival, Jazz Fest stands alone in presenting the highest caliber artists in such varied genres as gospel, blues, traditional and contemporary jazz, rock, pop, R&B, Cajun, zydeco and much more. Allyn will be bringing his program entitled, "The Evolution of New Orleans Drumming" to St. Charles Parish's Luling Elementary, in February 2018. 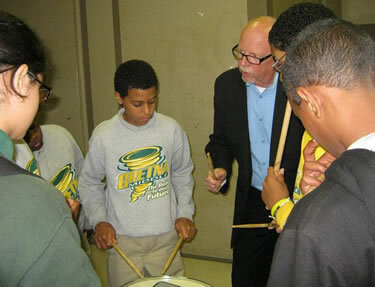 Beginning with the Original Brass Bands circa 1870, Allyn will provide the students a musical primer on the history of New Orleans drumming, demonstrating various styles essential to the history of New Orleans. Allyn also pays tribute to some of New Orleans' legendary drummers, including Warren "Baby" Dodds, Earl Palmer and Joseph "Zigaboo" Modeliste. Allyn presented his program in 2017 and the students loved it! Back by popular demand!! Click here to see Allyn's program from his Gretna Middle School Concert and Clinic. For more information about lessons, clinics and lectures, check out Allyn's Education Page. Allyn was featured in the September, 2012, issue of Modern Drummer magazine. The article provides a wonderful retrospective on Allyn's career, including a discussion of his close relationship with Jaco Pastorius, a rare perspective on Allyn from Peter Erskine, and a highlight of his current projects. From Wayne Cochran and the C.C. Riders to Dr. Hook, Tab Benoit, and dozens of other collaborations - Allyn holds a special place in music history. We are excited for everyone to read the article and would especially like to thank Cleve Warren and the whole team at Modern Drummer magazine!